It has been such an exciting week for all. There have been two trips this week. Year One enjoyed their first school trip of the year with a visit to Washbrooks Farm where they learnt more about life on the farm. It was a beautiful day and the pupils were able to enjoy a ride on a tractor as well as lots of time in the outside play area. On Thursday, Year 2 went off to the Royal Pavilion to learn more about life during the Regency era. They were fascinated to learn more about the life of Prince Albert and have started some beautiful writing and drawings, which will go on display outside their classroom. Be sure to take a look when you are at our next Open House Morning, which takes place on Wednesday 17th October. It has also been a busy week with Sports fixtures. All our Year Five girls went off to Our Lady of Sion in Worthing for a netball tournament on Wednesday afternoon. They had a really enjoyable afternoon as well as sporting success! There were six teams, all our Deepdene girls were split into mixed teams with pupils from other schools, and so it was a great opportunity for our pupils to meet other young people. All girls played exceptionally well but special congratulations to Amelie, Issy and Selin who were playing in the winning team of the tournament and received a medal. I received a message from Dr Orchard, the Headmaster of the school, who wanted to tell me how delightful and lovely my students were at the event. I am very proud of you all. Well-done girls! Sporting success continued through to the Thursday when our boys played Shoreham College at football and won with a terrific score of 7-1! Well done to all the players but a special mention to our scorers: Stanley, Isaac, Dexter and Yahya. There is a picture of the team on our school Facebook page, so please do take a look. I was sorry not to have been able to attend the match in person but was delighted to hear of such a victory. On Thursday, a rather important letter from Balmoral arrived in the post, addressed to the Reception Class C/O Mrs Mills. 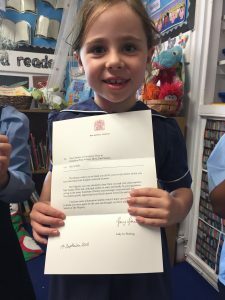 This was in fact a letter for our current Year One class who had written to the Queen in the last academic year, asking her lots of different questions. The class were delighted to have received a letter from the Royal Lady in Waiting together with some posters, which were very informative. My assembly yesterday focused on our Golden Rule ‘We try our best in everything we do’. We talked about setting goals, trying our best and if at first you don’t succeed, then having the courage and determination to try again. Over the next week, I will be inviting pupils to share with me individually their dreams and aspirations. I allowed time for reflection in the assembly for pupils to shut their eyes and to imagine their dreams and ambitions and I am looking forward to hearing about them. At Deepdene, I really believe there is a strong sense amongst all of us with ‘trying our best in everything we do’ and this attitude is really important to us as a school community. We ultimately aim to support our pupils, to be the best versions of themselves. Today, pupils came dressed in denim and brought donations for the charity ‘Jeans for Genes.’ I have seen some fabulous style and some creative looks around school today. Thank you so much for all your donations, we have raised £140 for this very worthy charity. Our violin teacher Michele Scopes has some availability to take on some additional violin students. A letter went out on ParentMail earlier in the week, so please contact her directly if you have any enquiries. Monday 24th September: Year 3 Trip to Butser Ancient Farm. Tuesday 25th September: Year 6 interviews for Senior Positions of Responsibility with the Head and Deputy Headteacher.